Over the last week or so, the gaming community has gotten a pretty good glimpse of what developers think of third-party key resale marketplaces like G2A. We had tinyBuild step up and accuse the site of improperly addressing fraud, while G2A responded by releasing a developer royalty program. Now we have Lars Doucet, lead developer on Defender's Quest by Level Up Labs, taking to Gamasutra to issue a rather surprising decree: he'd rather folks pirate his game than buy it on a key reseller site like G2A. We need to backtrack here a bit for those who haven't been following this story. The argument developers and game publishers have is that G2A serves as a great platform for thieves to sell stolen goods. Essentially, they grab stolen credit card info from a text dump, use it to buy a bunch of game keys and then sell them on G2A. The game makers get their money when they sell those keys, and if it stopped there, I doubt they'd be upset. However, we're forgetting about the stolen credit card holder. That person sees the fraudulent charges, calls the credit card company and then the transaction is charged back. The game maker sells 500 keys, for instance, the keys are in the possession of G2A shoppers and then the game maker sees the money made from the big sale vanish thanks to the chargeback. These fraudsters are using G2A to sell their stolen goods. It's like G2A is the shady alley the thief sells his stolen movies in. Okay, so why would Doucet rather you pirate games than buy them from G2A? 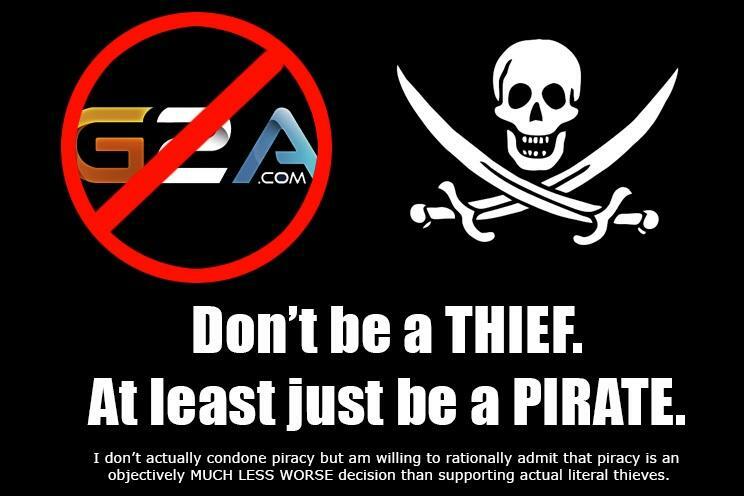 You can read the full and interesting post by hitting the source link below, but it basically boils down to this: Doucet says piracy is copyright infringement while buying stolen games on G2A is straight up illegal theft. While piracy gets you a free game, it costs time, puts you at risk for ISP violation or malware and strikes against your moral obligations to pay for goods. Piracy is a bad choice, argues Doucet, but it's not the worst. Buying games from G2A is cheap, but it's more expensive than piracy. Publishers and developers regularly cancel keys that are stolen (obviously without giving the buyer a refund), something that doesn't happen with piracy. Then there's the fact that you, as a consumer, could be participating in the literal theft of a good, not just copyright infringement. Again, this is all a summary of what Doucet argues. What do you think? Is G2A fine? Do you only use Steam? Are you a staunch pirate?